Bobby Seale, Ericka Huggins, and the Black Panthers: The 1970 murder trial in New Haven (PHOTOS). These drawings are the only known visual record of the 1970-1971 trial of New Haven, Conn., Black Panther Party members for the murder of fellow Panther Alex Rackley. Suspecting that Rackley was a police informant, Panthers shot and killed him in 1969. Those who pulled the trigger admitted their guilt. The question at stake in the trial was whether Panther leaders Ericka Huggins and Bobby Seale were involved. Robert Templeton, a sketch artist and painter, received a commission from CBS News to document the trial. The courtroom was technically closed to artists and photographers, so he had to hide his work. Templeton executed his drawings in two stages, first sketching initial impressions in pastel, and then making larger, more complete images on helicopter rides from New Haven to CBS headquarters in New York. CBS showed the finished products on the evening news. In 1971, Seale and Huggins were released after the jury failed to reach a verdict. The Panthers who had admitted to killing Rackley were convicted. The complete collection of Templeton’s Black Panther trial sketches is in Yale’s Beinecke Rare Book and Manuscript Library and can be viewed online. 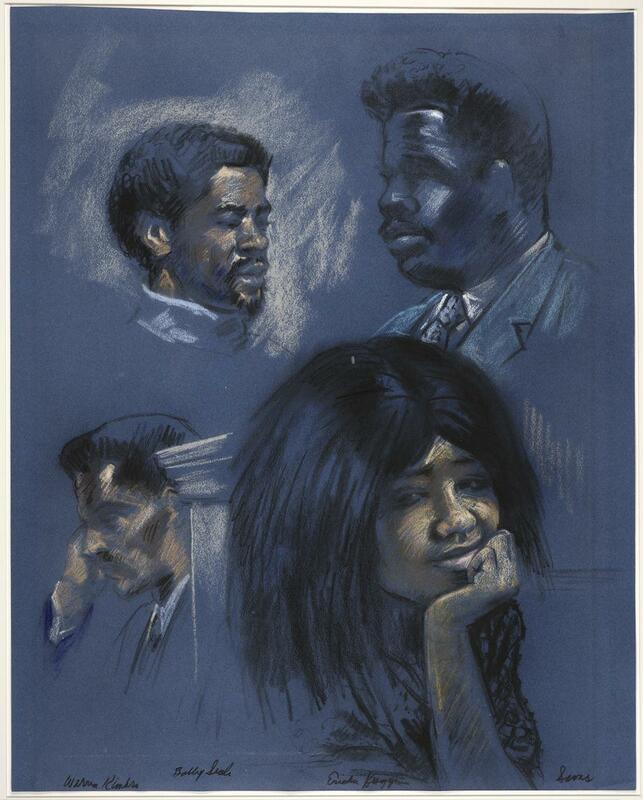 Robert Templeton, “Sketch of four head representations, including Ericka Huggins, Warren Kimbro, Bobby G. Seale and George Sams Jr..” Drawings and sketches related to the trial of Bobby Seale and Ericka Huggins, New Haven, Connecticut. Yale Collection of American Literature, Beinecke Rare Book and Manuscript Library. Used by permission of the Robert Templeton Estate. 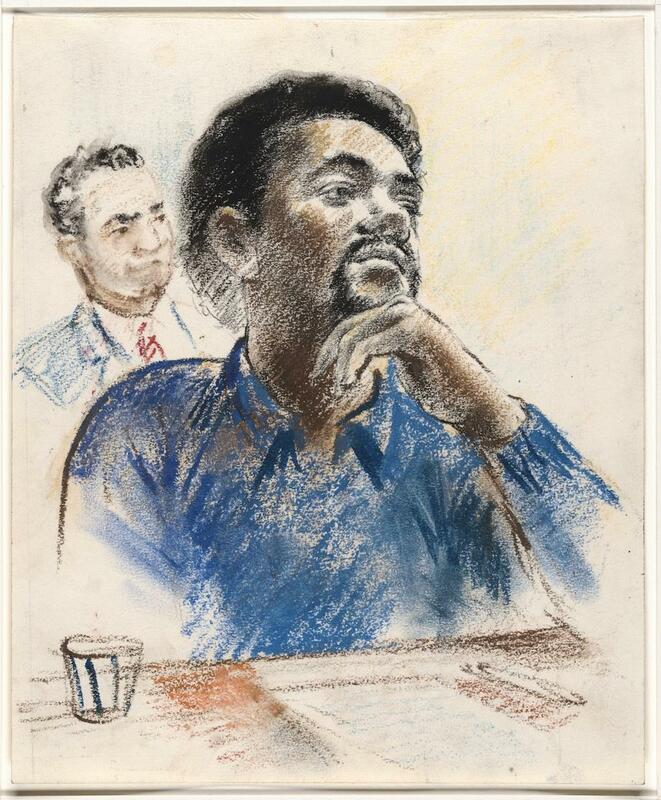 Robert Templeton, “[Drawing for CBS Evening News of Bobby G. Seale with Arnold Markle, State Attorney for the Judicial District of New Haven, in the back ground].” Drawings and sketches related to the trial of Bobby Seale and Ericka Huggins, New Haven, Connecticut. Yale Collection of American Literature, Beinecke Rare Book and Manuscript Library. Used by permission of the Robert Templeton Estate. 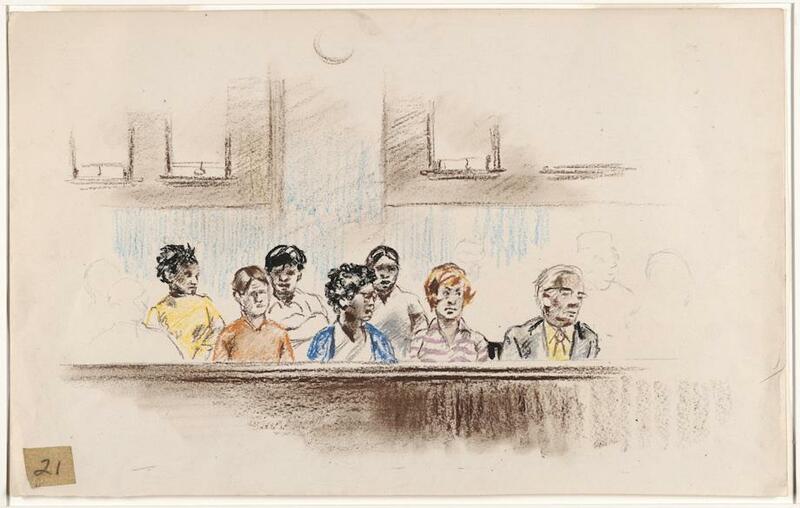 Robert Templeton, “[Drawing of jurors consisting of four African American men and women, two white men or women, and one elderly white man].” Drawings and sketches related to the trial of Bobby Seale and Ericka Huggins, New Haven, Connecticut. Yale Collection of American Literature, Beinecke Rare Book and Manuscript Library. Used by permission of the Robert Templeton Estate.